What’s more romantic then a summer picnic? 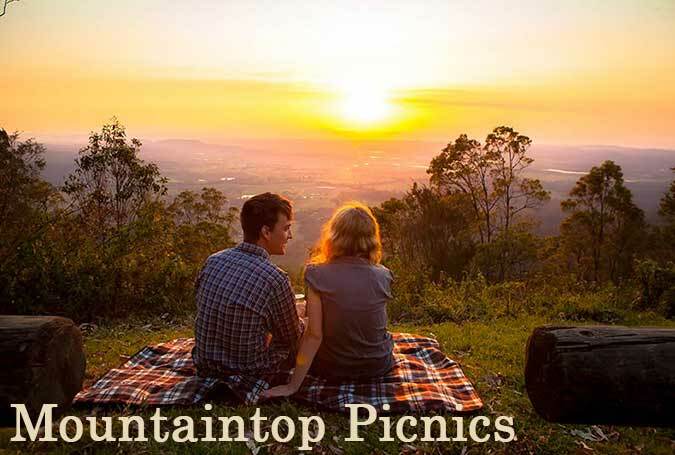 How about a summer picnic on top of the mountain at Powder Ridge! The ultimate romantic picnic starts with your chef-prepared basket ready and waiting for you. You’ll take a relaxing chairlift ride to your own picnic area, where you can spend time enjoying the spectacular views of Middlesex county and enjoying your lunch. When finished, hike back down taking in nature at its best. Cheese & meat assortment with crackers, crustinis with pesto chicken salad, bruschetta, eggplant capona, pasta salad, fresh fruit, dessert, lemonade & tea. $39 plus tax. Your choice of wine or craft beer can be purchased for your picnic at the Tavern. BBQ ribs, cornbread, corn on the cob, pasta salad, watermelon, lemonade & tea. $79 plus tax. Picnics are available Friday, Saturday & Sundays during open hours with reservations. A 48-hour notice is required. Picnic baskets include everything you need. Please, no outside food or beverage and no fires. Please call (860) 852-5444 to make required reservations. A 24-hour notice is required to reschedule or cancel. Please provide us the preferred time and date for your picnic, along with the number of people attending. If you have more than a family of four, please let us know and we can provide a custom package for you.